The best sandwich Biscuit's owner David Ligatich ever ate was made by his grandmother. Growing up in Portland, his mother would drop Ligatich off at his grandma's house every morning before grade school. There, his grandma, Sylvia Harris, would make him a masterpiece between two slices of bread that will never be topped. Though simple, it was delicious — two pieces of sourdough, sliced turkey, mayonnaise and pickle relish. "Everything she made was delicious," Ligatich said, "and that sandwich was amazing." While Ligatich said his grandma, who passed away 20 years ago, wasn't a chef, she seemed to be able to work magic in the kitchen. She made him the same meal every morning for five years, and Ligatich has yet to find anything better. And no matter how hard he tries, Ligatich never seems to be able to replicate his grandmother's sandwich. Even when he buys the same brands of ingredients, it doesn't make a difference. "I've tried so many times, but it's never the same," he said. "It's missing love." People are crazy — and quite particular — about their sandwiches, and August, as National Sandwich Month, celebrates that obsession. The definition of a sandwich — tasty fillings between two slices of bread — is hardly needed, as everyone has a history with the delicious creation, be it fond childhood memories of peanut butter and jelly in the lunchroom, a grilled cheese to cure the sniffles, or the turkey sub you just ate at your desk. Many attribute the sandwich name and its modern popularity to an Englishman and his obsession with gambling. As the story goes, in the 18th century the fourth Earl of Sandwich, John Montagu, felt a rumble in his tummy during a 24-hour marathon gambling session. On a hot streak, he instructed his personal chef to whip up something that would not interfere with his game. The cook handed him sliced meat between two pieces of toast, the perfect one-handed meal for the Earl. Though Montague's prodding was far from the first sandwich ever made, most agreeing the ancient origins probably stem with the Greeks and other Mediterranean cultures, his gambling buddies did spread it among the English gentry. And since those times the sandwich craze has spread all across the world, including East Multnomah County. Though not everyone has had the pleasure of tasting Ligatich's grandmother's creation, Sugarpine Drive-in in Troutdale has brought sandwich artistry to the region. The new drive-in restaurant in Troutdale made its home at Glenn Otto Community Park, 1102 E. Historic Columbia River Highway. The popular new eatery specializes in bringing elements of fine dining to casual comfort foods, all within a stone's throw of the river. "It's all about the layering of flavors and textures, said Ryan Domingo, who owns Sugarpine alongside Emily Cafazzo. "For us, that means you pay attention to each element that composes the sandwich." While they admit that high-quality ingredients are important, the key to Sugarpine's sandwich success is how it is all assembled. "It's about trying to figure out the order of how (the ingredients) should land," Domingo said. "You're trying to keep moisture away from the bread sides by putting items like greens or cheese closer to the bread, or items like tomatoes closer to the inside." And the sauce does more than just add flavor. "You need to add moisture to the sandwich, but you're also blocking the bread from excess moisture from the other ingredients," Domingo said. Sugarpine has plenty of tasty offerings, like its decadent ice cream and refreshing salads, but it seems like the sandwiches have created the perfect bridge between fine dining and casual eats. 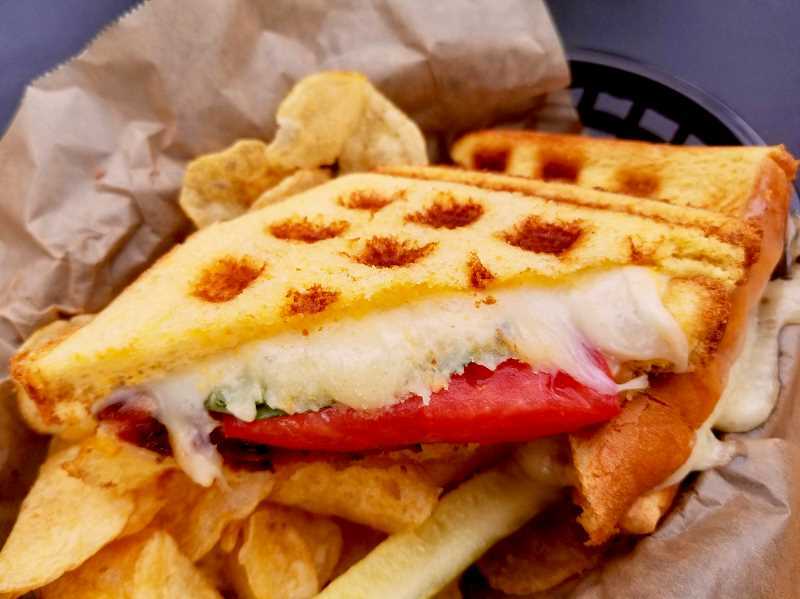 Their offerings include a pulled pork sandwich, one filled with fresh ingredients from local farms, and a waffle iron grilled cheese — not only making tasty grill marks but also locking in the flavors of the sandwich. "You really want the bread to hold up to the flavor you're trying to put in the fillings," Domingo said. Monica McAllister's favorite sandwich was inspired by what her father loved to eat. Her perfect choice is a tomato and cheese sandwich, perfectly seasoned with a deft touch of salt and pepper. "My dad always used to eat them, and what he likes I like," she said. Shawn Engelmann, who was visiting Oregon from Minnesota, is a fan of the classics. 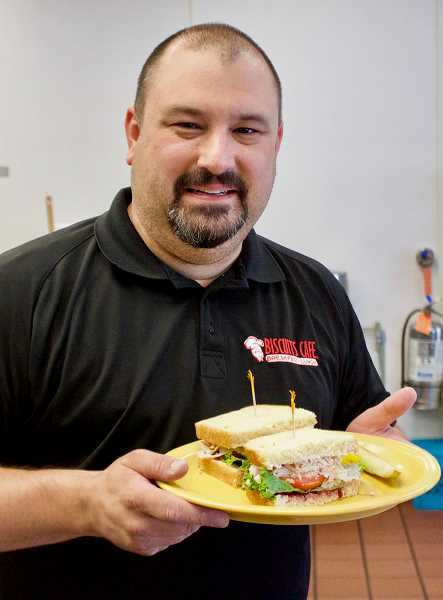 "I love them all, but you can't go wrong with a good old-fashioned cold-cut sandwich," he said. 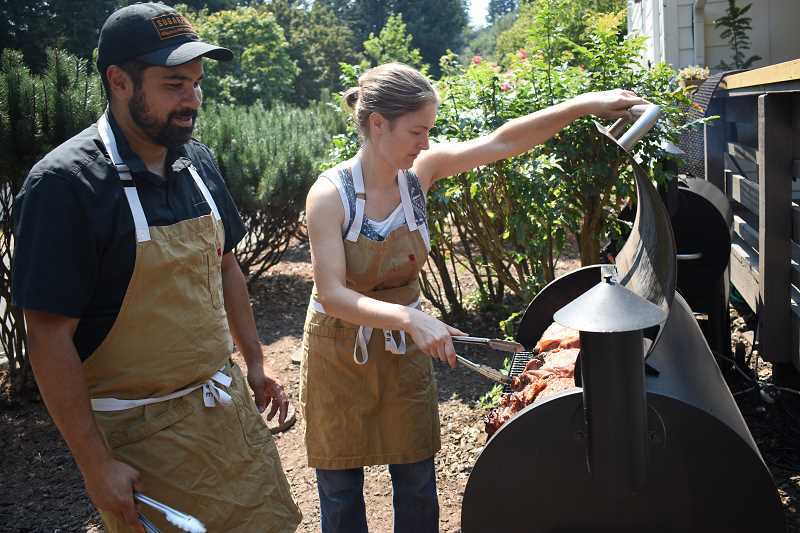 Ryan Weber is something of a sandwich expert, not only because he enjoys eating about four a week, but also because he works for Papa Bear's Smoked Meats & Catering, a Tillamook-based catering business that specializes in smoked sandwiches. And though he was visiting Troutdale for the annual Oregon Bigfoot Festival, he still had sandwiches on the mind. "I love a good French dip," Weber said. "The key is to have super thin meat that melts in your mouth." For Ligatich, even though he still dreams of grandma's sandwiches, there are plenty of other tasty options he serves up at his Biscuits Cafe restaurant. Even if Biscuits, 1905 N.E. Division St., may be best known for their giant cinnamon rolls — their sandwiches are a popular choice. From their classic club and BLT to the Reuben, they have a wide range of choices. His favorite is the turkey cranberry. "It's like eating Thanksgiving dinner," he said. The latest addition to the menu is a barbecue pulled pork sandwich. The key, Ligatich said, is to add the sauce after grilling the pork. Then topping it with cool coleslaw to bring the whole masterpiece together. Everybody has different taste buds, so while the components of a perfect sandwich may vary, at the end of the day Ligatich said the key is fresh ingredients. "People want their meat freshly sliced, crisp lettuce and juicy tomatoes," he said. 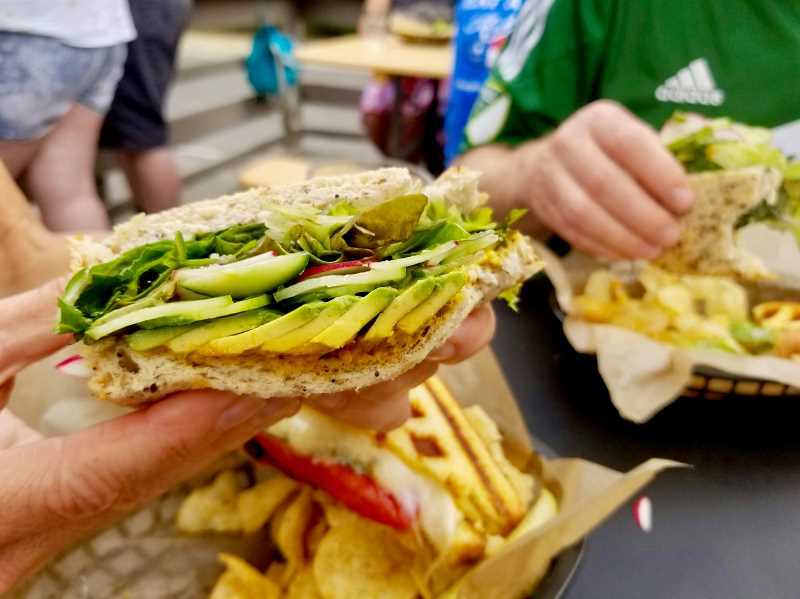 And even when Sandwich Month officially ends, East Multnomah County will keep loving their two-slices-of-bread-based wonders. 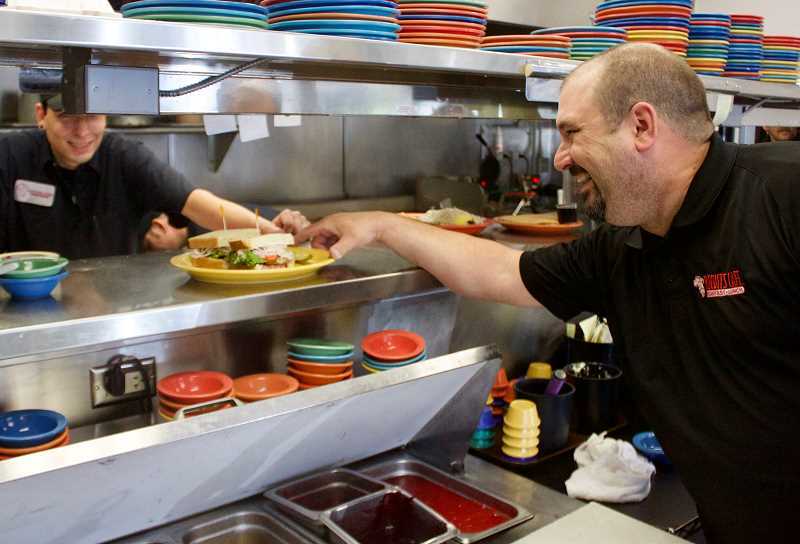 "No matter what your favorite is," Ligatich said, "you can't go wrong with a sandwich."